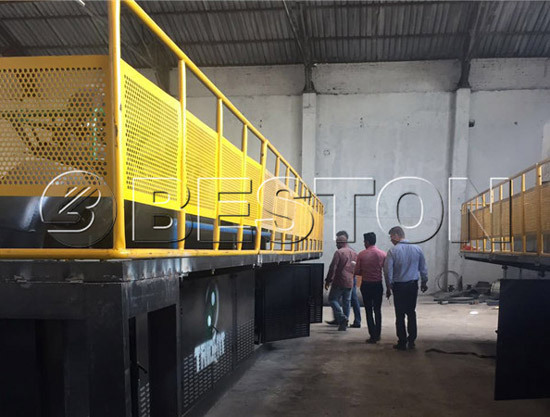 As a new type of environmental protection equipment, Beston fully continuous tyre pyrolysis plant has become more and more popular in the international market. 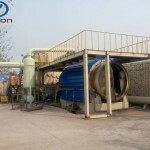 Now let me give you a brief introduction of continuous waste tyre pyrolysis plant. The fully continuous tyre pyrolysis plant not only can handle 24 to 30 tons of waste tires per day, but also feed in one side and dischage in another side. So the work efficiency of the device is very high. 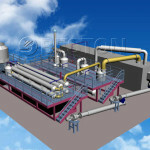 And this plant can be also used to pyrolyze waste plastics, oil sludge, rubber, medical waste. To a large extent, the continuous tyre pyrolysis plant can save a lot of operating costs for us. That’s because it has small size, small floor area, simple operation, less operator, etc. 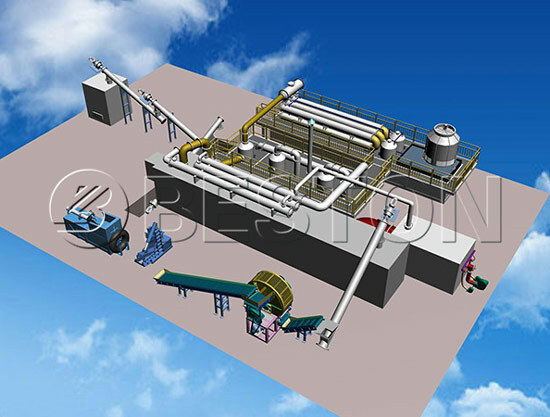 A complete set of continuous waste tyre pyrolysis plant is mainly composed of many parts, they work together to ensure the normal operation of the plant. These parts are tyre shredder, feeding conveyor, burning room, reactor, heat exchange sytem, oil gas pipe, mainflod, damping tank, oil condenser, hydrosea, steel and carbon black separator, carbon black discharger, carbon black storage tank, flue condenser, dedusting system, water tank and cooling tower. Firstly, waste tyre should be broken into 30-50 mm rubber pieces by pre-treatment equipment to meet the requirement of the spiral feeding device. Secondly, these rubber pieces are conveyed to the moving horizontal pyrolysis reactor through feeder system, then fire the fuel(coal, wood, fuel oil, natural gas, etc.) to heat the reactor. 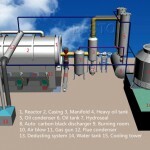 it will start to pyrolysis and oil gas will be generated the temperature increases to relevant degree. Then, the oil gas will be cooling down by spray cooling system, it would be liquefied, go into the oil tank. And at the same time, some non-condensed gas come into hot air circulation heating system by secondary fire retardant damper, it will be recycled for heating reactor as gas material. At last, Exhaust gas will go to the strong spray de-dusting system for removing pollution, then let environmental gas go to the air. The carbon black emissions and recycled through second sealed discharging system. 1. Combustible gas can be recycled as fuel to heat the reactor, which is enough to meet the needs of device self-heating. It will save energy for the whole working process. 2. The pyrolysis oil can be directly used as the fuel oil for ship, and it can be further classified and processed, then formation of oil products such as petrol, diesel with high benefits. 3. The carbon black from tyre pyrolsyis can be reprocessed into high quality carbon by the carbon black processing machine Or make carbon brick by briquetting equipment. 4. Steel wire can be sold directly or make steel bloom by hydraulic press-packing. The continuous waste tyre pyrolysis plant adopts the screw feeding sealing system technology, hot air heating furnace circulating heating technology, heat drying technology with high heat exchange efficiency and capacity. Impeccable electrical control system save labor costs. Three waste utilization reasonable recovery can basically realize of zero emissions, safety and environmental protection. 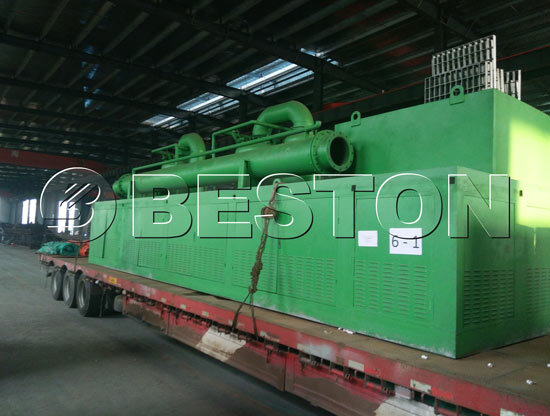 The traditional pyrolysis plant with high energy consumption, the energy can’t be fully recycled, the poor tightness of equipment, the goal of energy saving and environmental protection can’t be fully realized during the production process. High energy input, increased production costs. 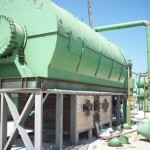 The intermittent feeding and discharging system is low efficiency and high labor cost. 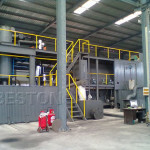 Beston Group has combined with years of experience to produce the latest fully continuous tyre pyrolysis plant. So far, these products have been exported to more than 20 countries: United Kingdom, Turkey, Poland, Nigeria, Ukraine, Romania, Malaysia, Brazil, Thailand, Uzbekistan, Hungary, Dominica, Australia, etc. If you want to invest in a fully continuous tyre pyrolysis plant to make money, please contact us at any time. And we will give you a detailed cost estimate and reasonable prices as soon as possible.